A particular blog in the internet states that, “Boxing is about more than just how many opponents you can knock out. It’s not a way of life, but a way you view your life and the world around you.” But how much do people understand about this perception? Do they have a concrete grasp on how boxers lives their life and those close to them? 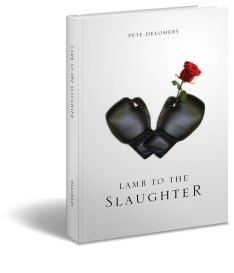 Author Pete Delohery provides a glimpse into the world of boxing and what life in the ring is like in his new book, Lamb to the Slaughter, a novel about love and courage, sin and redemption. “Iron” Mike McGann, 32 years old, is facing the twilight of his prizefighting career. Desperate for his future, he has refused to honor his promise to his wife to quit the ring and start a family. In despair, his wife, Madge, is leaving him. Rufus “Hurricane” Hilliard, Mike’s next opponent, is the most menacing presence in prizefighting. He has won all 22 of his fights by knockout and is said to be a former enforcer for something called The Black Mafia. But behind Rufus Hilliard’s menacing ring presence lives a man nobody knows, a complex man who despises his own image. Unexpectedly left alone before his bout with McGann, Rufus “Hurricane” Hilliard is forced to confront the past that haunts him and the future he dreads. Rufus “Hurricane” Hilliard vs. “Iron” Mike McGann, just another fight shown on The Continuous Sports Network, but by the time it is over the lives of these and many others will be forever different. Readers will witness more thrills and excitement as the surprising end unfolds in Lamb to the Slaughter.